The Orwell Papers, which are housed at UCL Special Collections, University College London – where the Orwell Foundation is also based – have been formally inscribed to the prestigious UNESCO Memory of the World International Register, which lists documentary heritage which has been recommended by the International Advisory Committee, and endorsed by the Director-General of UNESCO, as corresponding to the selection criteria regarding world significance and outstanding universal value. UCL has achieved this accolade for the Orwell Papers following a highly competitive and selective process. 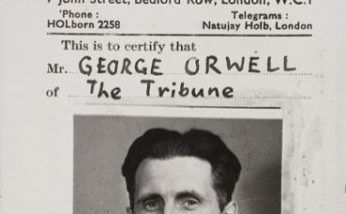 The Orwell Papers comprise the personal archive of George Orwell and includes manuscript notebooks, diaries, letters and other personal papers, and photographs belonging to the author. The collection features the first hand-written notes of some Orwell’s most famous word and phrases, such as “Two Minutes Hate”, “Newspeak”, and “War is Peace. Ignorance is strength. Freedom is slavery”. The Orwell Archive, repository of almost all surviving Orwell manuscripts and artefacts, is the cornerstone of the relationship between Richard Blair and the Orwell estate, the Orwell Foundation, and UCL, the Foundation’s home and from where it manages Orwell activities: lectures, public events and the Orwell Prizes. It’s a relationship all parties look forward to developing closely over the next few years. This prestigious award granted by UNESCO to the Orwell Archives at UCL is a clear indication of the value attached to the works of George Orwell. Not only am I immensely proud of this achievement and what it means personally, but also to those who have put in so much hard work to bring about this singular recognition. I am delighted that the papers of George Orwell held at UCL have been formally inscribed on the UNESCO Memory of the World International Register. This is a prestigious award, and we are very pleased that the importance of this collection has been internationally recognised. The George Orwell archive is the most comprehensive body of research material relating to the author anywhere. Manuscripts, notebooks and personalia of George Orwell were given to UCL in 1960 on permanent loan by his widow on behalf of the George Orwell Archive Trust, and have been supplemented by donations and purchases. The aim of the Trustees of the Archive was to establish a research centre for Orwell studies for all to use and to safeguard the papers for posterity. Read more on the UCL website.